Sakura (cherry blossom) along the Tamagawa Waterway (玉川上水) in Koganei, Tokyo. The stretch of about 4 kilometers of cherry trees was extremely popular for hanami (flower viewing). It is very difficult to imagine that only a century ago there was this much natural beauty in a city that now consists almost entirely of concrete and asphalt. On this photo, it is still a wide and open landscape. It’s like, “This is Tokyo? No way!” But actually, scenes like these were quite common in Tokyo during the Meiji Period (1868-1912). According to the still existing Koganei Cherry Tree Monument (小金井桜樹碑) near Koganei Bridge, the trees were first planted here in 1737. 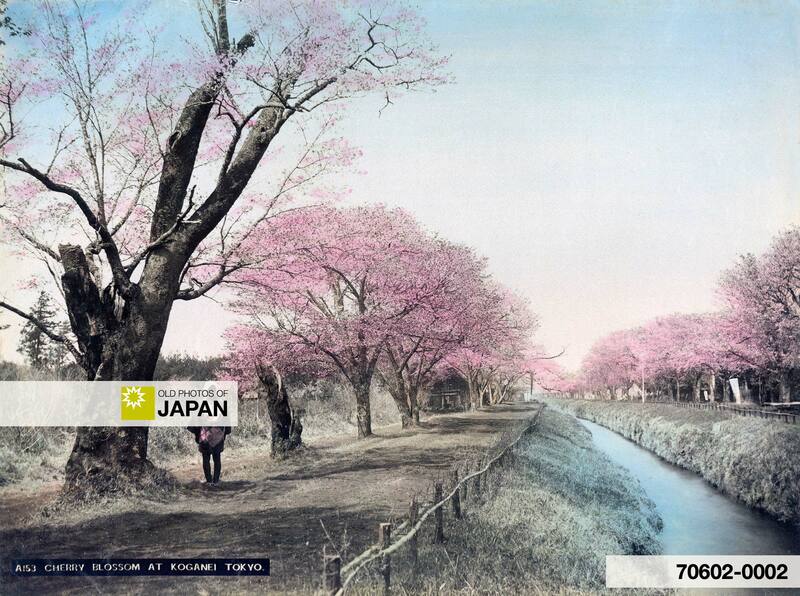 Emperor Meiji visited Koganei in 1883 (Meiji 16), making it one of the more popular sites to do hanami in the capital. It was a conveniently located destination because of Sakai Station (present-day Musashi Sakai) and Kokubunji Station on the Shinjuku-Tachikawa Line of Kobu Railways. Most of the cherry trees were cut down in 1954 (Showa 29) to build the Itsukaichi Highway, the open spaces where people could sit also disappeared. Almost no cherry trees remain. Although it appears to be a small stream, the Tamagawa Waterway was the main source of water for Tokyo until the Murayama (1927, better known as Tama Lake) and Yamaguchi (1934) reservoirs were built. It appears to be impossible to pin down the exact location where this photo was taken, so the Google map shows just a spot on the Tamagawa Waterway Green Lane (玉川上水緑道), which follows (and mostly covers) the original Tamagawa Waterway. You can also licence this image online: 70602-0002 @ MeijiShowa.com. While it’s true that open landscapes with lots of wild uncut nature is nearly impossible to find in Tokyo or anywhere in most of Japan now, I will say that there is a continuous effort to preserve what’s left, even if it is constantly trimmed and controlled and not really “natural”. I happen to live really close to this area, and though I’ve never been to Tamagawa Josui in Konagei, I can say that there are still many areas near there, surrounding Tamagawa, that still have cherry trees and places for viewing. Cherry-blossom viewing is still extremely important in culture and society here so I don’t think people will ever trade it in for anything. Have bought Some times ago a lot of Japanse photo,s. Is it normal that The PSP’er is verry thin ?